Get more petal for your pound with these cheap flowers by post... they're thrifty but nifty, tight, not tight-fisted; cheap, but so much more than cheerful. Have flowers delivered anywhere in the UK with free standard flower delivery from Monday to Sunday. Order by 10pm Monday to Friday for next day delivery and by 9pm on Saturday for Sunday delivery. Easy ordering and excellent post payment service, including regular updates regarding processing and delivery of my order.The recipient described the flowers as spectacular. Excellent although I dont see how you could post them through the letterbox! I have no idea whether your flowers were any good or not - I didn't post them to myself! Ordering on line was fine. Mother in laws birthday present fell through (lost in post) so ordered flowers night before - arrived on her birthday. Calamity avoided.Lovely flowersHave lasted ages. Great customer service, prompt delivery, and a good quality product that has lasted a long time. Good job all round. Much better than rival flowers-by-post companies. Beautiful fresh flowers are now available even for a tight budget. Send cheap flowers by post with FREE delivery from SerenataFlowers.com. The beauty of it all? Guaranteed freshness with FREE delivery seven days a week. 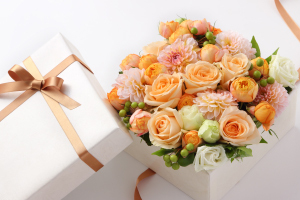 Postal flower gifts are convenient and inexpensive option to spoil your loved ones on a special day. Looking for one of the cheapest flower delivery services in the UK? SerenataFlowers.com offers flowers from only £14.99 and ticks all your boxes. Impress your friends and family with stunning bouquets made from the freshest blooms available. Even for Valentine's Day 2018, you can afford to spoil your sweetheart with beautiful Valentine's Day flowers delivered to their door - check our latest Valentine's Day collection to get inspired. Send fresh bouquets nationwide in the UK, in just a few clicks. If you prefer a guaranteed delivery date, or next day delivery date, choose our courier delivery. Our flowers arrive safely gift wrapped in a cardboard box. Each bouquet comes with FREE greeting card, flower food and care instructions. It doesn't matter if they arrive with Royal Mail or courier delivery. Our postal flowers are sure to delight and impress. Cheap flower delivery doesn't mean you should compromise on quality. We offer best quality and only the freshest bouquets sourced from flower markets. We cut out the middle men, shortening the travel time of our postal flowers and costs. That means you can send flowers cheap, while getting only the freshest blooms and bouquets. All our flowers by mail are carefully crafted by hand by our in-house florists. Our inexpensive flowers make a wonderful and lasting first impression. Order your flowers online at SerenataFlowers.com. Choose your bouquet, delivery date and enter your and recipient's details. Once you're done, you will receive tracking code and notifications. These will let you know the very moment your bouquet arrived at the destination. Flowers by post from SerenataFlowers.com are best value flowers online delivered by an award-winning service. If you're looking for cheap flower delivery, let us show you how to save money while enjoying the best quality blooms. What flowers are safe to send by post?